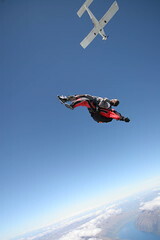 Have you ever jumped out of plane? Ever made a swing from a trapeze? Have you felt the weight, the electricity that hums in that space between letting go and the next? ”A place that demands being honest with yourself without regard to the cost of personal anxiety. A place that demands being present with all of yourself…left alone with an immediacy that astonishes, chastens, and exults.”(Kushner) might be one way of describing it. I have jumped from a plane and I have swung from a trapeze. I still remember the feeling of letting go of that Cessna’s wing-brace and the last glimpse of its undercarriage that shot my heart into my throat... then falling that felt more like flying above the Black Hills of South Dakota, before the rip-chord was pulled and I sensed something like solid in that parachute silence. Stuff like this doesn’t leave your memory, it changes you. Or at least gives context for the bigger things in life to come. As I continue to live in one of the most transitional, liminal spaces of my life so far I have these times wherein I feel that tension, the electric memory of those moments between letting go and feeling the touch of what is next. It might be that the physical risk, jumps I take throughout life are only foreshadows, preemptive metaphors of the deeper, beneath the surface risk and jumps I will take later in life…. like now. When those Hobbits left home they didn’t know it at the time but they soon found that they were likely not to make it ”there and back again” like Bilbo once did. And even when they did return, they didn’t all stay. Some were too changed to call it Home anymore.